In the flourishing community of Woodbridge, both residents and visitors enjoy the area’s many historic landmarks and recreational areas. With the growing population and commerce of the area, more and more people are commuting to and around the city. To make this drive more enjoyable and safer, professional mobile car detailing is the answer to keeping your car looking nice and your commute safe. Car Detailing Shop offers premium and customizable Woodbridge car detailing packages to address both interior and exterior detailing with ease. Our 100% mobile service is ideal for anyone with a busy schedule and for businesses that rely on vehicles as part of their services. With our range of car care offerings, we ensure your vehicles are not only beautiful on the outside but safe on the inside! Engine Detailing: Why clean a part of your car you never look at? While this area isn’t readily visible like your car’s exterior, cleaning it with our Engine Shampoo and Dressing service can improve how your engine runs and will help find problem areas early. Our engine detailing will clean away dirt, grease and debris to help your engine run cooler and also identify fraying, loose or damaged parts before they cause a breakdown. Wheel Detailing: Your wheels face a lot of dirt, rocks and a host of other materials on the road. A buildup of this debris can begin to affect your tire performance and give you a less than smooth ride. With our wheel detailing we’ll address each area of the wheel to remove damaging material and identify any problems early. Car Detailing Shop’s 100% mobile Woodbridge auto detailing offers the ultimate in convenience in car maintenance and cleaning. 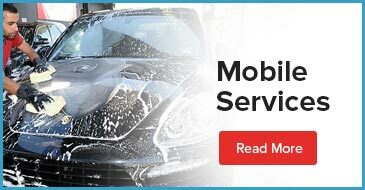 To experience the Car Detailing Shop Woodbridge auto detailing difference and our Satisfaction Guarantee, Contact Us today to book your mobile appointment!